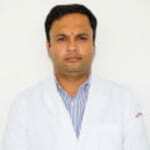 Dr. Chetan Mahajan is a famous Internal Medicine Specialist in Medanta Hospital, Gurgaon. He has helped numerous patients in his 11 years of experience as a Internal Medicine Specialist. He is a D.M. (Nephrology) from IPGMER & SSKM Hospital in 2016, MBBS from Acharya Shri Chander College of Medical Sciences in 2007, MD (General Medicine) from Sher- I Kashmir Institute of Medical Sciences in 2012. His Specialization in Nuclear Cardiologist and General Neurologist. He grant some of the services like: Treatment of Headaches, Treatment of Fever, Treatment of Stomach Pain, Treatment of Body Weakness, Prevention & Treatment of Diabetes, Treatment of Cold Cough, Treatment of Acidity, Treatment of Bronchiectasis, Treatment of Chest Pain and Management of Sugar Disorders He is currently associated with, Medanta The Medicity Gurugram Medanta The Medicity Sector - 38, Golf City, Gurugram. You can visit him on TUE, THU and SAT (04:00 PM - 06:00 PM). You can book an instant appointment online with Dr. Chetan Mahajan on Lybrate.com. Lybrate.com has an excellent community of Internal Medicine Specialists in India. You will find Internal Medicine Specialists with more than 31 years of experience on Lybrate.com. Find the best Internal Medicine Specialists online in Gurgaon. View the profile of medical specialists and their reviews from other patients to make an informed decision. Dr. Chetan Mahajan is a renowned Internal Medicine Specialist in Medanta Hospital, Gurgaon. He has helped numerous patients in his 12 years of experience as a Internal Medicine Specialist. He is a D.M. (Nephrology), MBBS, MD (General Medicine) . He is currently practising at Medanta The Medicity in Medanta Hospital, Gurgaon. Book an appointment online with Dr. Chetan Mahajan on Lybrate.com. Lybrate.com has an excellent community of Internal Medicine Specialists in India. You will find Internal Medicine Specialists with more than 33 years of experience on Lybrate.com. Find the best Internal Medicine Specialists online in Gurgaon. View the profile of medical specialists and their reviews from other patients to make an informed decision. I am 60 years old. I want to increase my strength and stamina. I am a regular gym goer. I have a pain in my left knee and I feel that is due to a nerve. Please suggest. Should I use fat burners, along with my diet and exercise. I don't mind it being a placebo, just that it shouldn't have any serious side effects. Avoid all types of fat burners or medicines, since they can have severe side effects. Focus on diet reduction and increase exercise time/intensity. Add 2-3 Fruits to your daily diet before meals. 3. Cut down Sweets/Biscuits/ Colas/Juices from your diet. 4. Completely eliminate Puris/Parathas/Pizzas/Burgers/Fried Rice/Biryani etc 5. Eat slowly and mindfully. Reduce portion size. 6. Exercise daily - 'Intense' Cardio for 40-60 mins. This will keep you toned and trim. 7. Love yourself and respect your body. Fever with body pain and joint pain are initial symptoms of dengue and have to be confirmed with a blood test and treatment has to be given symptomatically with eating nutritious home made food with adequate fluid intake and taking physical rest but main thing is to prevent it and so - see to it that there is no stagnation of water in your house and nearby locality for more than seven days because these are the breeding grounds for mosquitoes. She is suffering from nausea vomiting and fever. The medicine is given according to doctor but no improvement. She becomes weaker. What to do. Get her admitted in a good hospital. Fever and vomiting could be becoz of anything like viral hepatitis or malaria. Get her diagnosed. Then treatment will work definitely. Sir, my mother suffering from throat irrigation from last 3-4 years. Mostly at night Please suggest me if there is any issue of throat cancer What should I do to cure it, she took medicines also but it comes back after some time. Hi she should take-- -- phatkari bhasam, a pinch of it + add desi sugar, take it with hot milk she will be ok. For more details you can consult me privately. Prefer some good sleeping peels to sleep I didn't get sleep everyday I sleep at 4 am like that help me out of thz prmb I need good sleeping peels suggest me some sleeping peels with good dosage to sleep soon and wake up later. Don’t take sleeping pills. You are so young. Try to relax yourself -- exercise. Exercise is one of the most important things you can do to combat stress. Take a few minutes to breathe in and out in slow, deep breaths. Reduce your caffeine intake. Write it down. Chew gum. Spend time with friends and family. Laugh. Massage. Eat a healthy diet. Pursue one hobbywalk in nature meditation. Yoga. For more details you can consult me. How bad is it to sleep just after having dinner and lunch without even a little walking everyday? I am also facing pain in stomach from last one day. What should I do to change my habit of just taking sleep after having food please help. Yes a drastic but gradual change is required. Hi, it seems you are suffering from 1. Gastritis/hepatitis or irritable bowel disease 2. Take an antacid 3-4 tsf 8 hrly 3. Get a blood investigation - liver function test done 4. Avoid fatty, oily meals 5. No fast food, no momos and samosas 6. No tea and coffee 7. Lots of water 8. Walk after meals 9. Eat less at nights 10. No soft drinks, hard drinks and no smoking recommended a private consultation. I am 26 years old and I am not a smoker not drinking at all but my resting resting heart beat is more than 95 per minute. I love to do workout in gym I prefer to eat healthy and homemade foods I am maintaining these are all good practices from last 2 years but now I observe that my heartbeat is more than the normal range. Please help me to figure out the reason for this problem in detail It is also requested to you to please tell me about the reason and the treatment for this problem. Hello Normal heartbeat range is between 70-90. So do not be tensed. *If you do hard work or overexert yourself mentally or physically it's definitely going to get increased. *If you have any other complaints along with it like breathlessness, sweating, giddines, pain in chest or hand then it is a matter of concerns. *Do yoga and pranayam it will balance your heartbeat *Take care. Be Happy. How long it takes to digest the food. How many times one should pass motion, How we can find out that whatever we eat have digested? I have pain in my legs. Would a good calcium tablet be of help. If yes please suggest. Thanks and regards. Hello,you can take homoeopathic medicines 1.Rhus Tox 30 ( 4 drops in little water) thrice a day for a week. 2.Calci Aid (Bakson) (2tabs) thrice a day for a week and revert. Keep a gap of 15 - 20 minutes in both the medicines.